Devoted fans, readers and admirers… All that time you’ve spent lavishing us with your attention and undying loyalty is finally about to pay off! Thanks to the generosity of the Furious 3 crew, Bikeridr is offering the contest to end all contests! Up for grabs is a free entry to the Furious 3, and three days accommodation at the Park Place Lodge in Fernie BC. For those of you living under a rock, the Furious 3 is a 3-day stage race in Fernie, BC. Ranging from tight single track winding through dense rainforest, to wide open mountain traverses. The course is guaranteed to challenge any rider. If that’s not incentive enough, it’s proving to be wildly popular and is already over 70% sold out! So what’s the scoop? How do you get in on this mind-blowing opportunity? Well, that’s the easy, and fun part. Below are three images. You must submit a comment with a caption for one, two or all three of the photos. That’s it. You’re in. For each image caption you contribute, you will get 1 entry (to a maximum of 3). So it pays to drum up a caption for each image. Sheldon and I will also award 2 bonus entries for what we deem to be the best caption for each image. If you caption 1 photo, that’s 1 entry. If you caption each photo, that’s 3 entries. If you completely kill it, caption all 3 photos AND win Sheldon’s and my favour for all 3 that’s 9 entries!! We will then take all entries and place them into a random draw for the winner. That’s it. Get creative. You’ve got 30 days. Contest ends October 21st. The fine print – We will contact the winner through the email left in their comment, so please use an email where you can be reached. We will give the winner 24 hours to reply before drawing another. Winning entries are redeemable for one entry – either a full solo entry, or half of a team entry. Update: The “Furious” Contest is also open to racers already registered!! Should you win, your race entry fee will be reimbursed! During the 12th day of his cross-China tour, Xiun began to wonder if his nutrition plan of carrying 65 cartons of fresh fish was a wise one. Despite needing to walk up every hill on the course, no one could touch Teddy on the descents. 2. In a race such as this, line selection is crucial. picture1: Li soon realized that he was slightly overpacked for his tour. Next time a pair of saddlebags will do. picture2: the course was a very fast open one with only one stump the entire race. 1. Xiu wished he had known the team was sponsored by China’s largest tofu company before he signed on as a domestique. 2. John demonstrates the importance of keeping your eye on the line when riding through a corner. 3. Jacques finally found a way to make up for his slack spandex. Some great captions so far. 3. The original version of what we now know as spandex shorts had the sole purpose of keeping things out of the big chain ring. 1. Why does this remind me of laundry day! 2. For crying out loud it’s 20 degrees out here, what’s his damn excuse! 3. The wheels are not turning here! 1. There are certain draw backs in being a delivery boy for the world’s greatest Chinese food restaurant! 2. Dammit Gary, I said distract the other riders! Sorry guys, I know I’m not eligible, but this was just too fun to pass up. Picture #1 – What the hell is slowing me down? Are my brakes rubbing again? Picture #2 – Excuse me, do you think this is a rash or just chafing? Picture #3 – What? Uphill race? I was told this was strictly downhill! 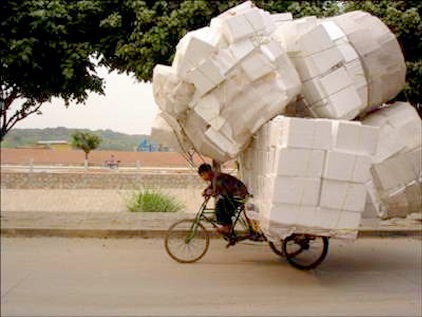 Pic 1 – Bill: Hey Charles, how can we reduce fuel charges in our delivery fleet? Pic 2 – Do you like CDs? SEE DEEZ NUTS! 1. Reuters, Beijing China – on the heels of scandals in gymnastics and soccer, the Chinese amateur sport federation is once again facing allegations of unfair practices regarding their national mountain biking training program. 2. It bends a little to the left… No, wait… my left, which would be your right! 3. This is what happens when you let your fiance pick the ring…. 2: Nothing to see here. 3: Check out those loafers! 3rd. demo day:try our new downhill bike developed for the very best. 1. Biao Chen reasoned to himself quietly that China’s birth control policy, in hindsight, suddenly seemed poorly thought through. 3. Long endurance rides would simply be foolish without a spare rim. 1. China’s newest environmental visionary Fu Kiu is clearly “thinking outside the box” with his latest green strategy to re cycle styrofoam. 3. After a slow start, frenchman Sylvain Sornis attacked late in the stage to capture his first win in Le Tour De Saskatchewan. 2) Eight inches of travel! 3) Jacques was the only rider in the Peleton able to produce cadence values less than zero. 1. i think i can fly. no, i KNOW i can fly!! this is a parachute! 2. apparently, the wind is coming from the NW, according to the wind vane. 3. no need drugs, i got something better. pic#2: Frank cheers for best friend, Bean. Pic#3: not recognizing his error, Jean-Luc prepared for the start of the hill climb. Thanks everybody for your comments!! We’ll announce the winner in the next few weeks! Pic 1: Faced with global warming, the world’s first Iglo/RV hybrid was really doomed from the start! Pic 2: Cedric Gracia kept himself “busy” in his retirement years. 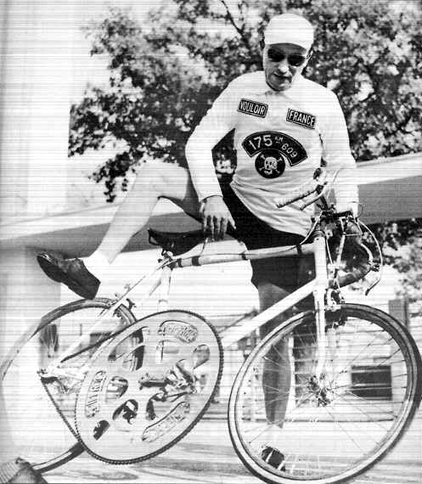 Pic 3: The decision by the UCI to allow performance enhancers led to some interesting innovations in bike design. Y’all, I wanted to add here, that incase you missed it, the F3 has release 100 new spots for 2011. If you didn’t make the cut for the first 200, now is your chance!